Editor-in-chief R.L. Nave said Mississippi Today writers covered the 2018 Senate races with an interesting approach: focusing on community reactions to the Senate candidates. 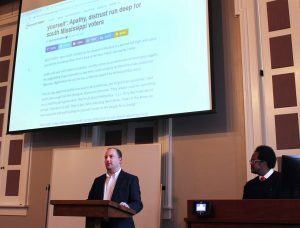 Nave and Adam Ganucheau, a reporter for Mississippi Today and former editor-in-chief of The Daily Mississippian, spoke to a crowded room in Barnard Observatory as part of the Center for the Study of Southern Culture’s Brown Bag lectures. Launched in 2014, Mississippi Today is an online news publication that largely focuses on civic reaction and discourse. This week’s Brown Bag Lecture focused on the 2018 Senate races, specifically Mississippi Today’s coverage of it. Nave said he wanted to report comprehensively on each candidate. “It’s not that we have an opinion on those sorts of things happening, we just recognize that we want to give people as much information as we can as an organization — who these people are, what they stand for, and what they want to do if they get into office so that people know,” Nave said. The Senate election was historic for the state because for the first time in the state’s history, Mississippians had a chance to elect two U.S. Senators and either elect the first woman to the Senate from Mississippi or the first black Senator from the state since Reconstruction. In the Nov. 8 regularly scheduled election, Republican Sen. Roger Wicker defeated challengers and returned to his seat in the Senate. Republican Sen. Cindy Hyde-Smith defeated former U.S. Secretary of Agriculture Mike Espy in a runoff for the special election on Nov. 27. 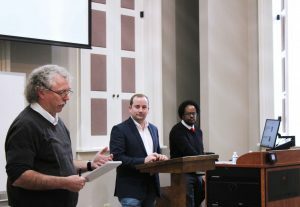 “What we found in this dispatch of stories is that, even though they were very regionally focused, we would write a story that would resonate with someone from another part of the state,” said Ganucheau, who covers state politics and government for Mississippi Today. According to Nave, political journalism often fails to get out into communities, which results in more generic reporting. “We intentionally took the politicians and the candidates out of this process and let the stories stand as they were,” Nave said. University professors and Oxford residents alike were in attendance at the Brown Bag Lecture. Oxford resident Marianne Wharton attended the event and said she was impressed with Mississippi Today’s localized coverage of the elections that made national news.